ExxonMobil Chemicals highlighted two new grades of Vistamaxx performance polymers for the packaging sector during CHINAPLAS 2015. The first grade, Vistamaxx 3588FL, is used pure in the sealing layer in cast polypropylene (cPP) films and heat-sealable biaxially oriented polypropylene (BOPP) films. Using pure Vistamaxx 3588FL to replace standard terpolymer PP in the sealant layer of three or five layer heat sealable cPP or BOPP films can enable higher speeds for horizontal and vertical form fill and seal (HFFS and VFFS) packaging operations. “We see there is a demand in the market for more economical packaging and processing because of rising costs,” Mirando Lo, Vistamaxx Business Manager Asia Pacific, ExxonMobil Chemical explained the rationale behind this innovation. Vistamaxx 3588FL delivers 10°C lower seal initiation temperature (SIT) to 95°C as well as higher hot tack window that current products in the market were not able to achieve. That leads to significantly improved packaging line performance, she emphasized. In cPP films, the use of Vistamaxx 3588FL in the sealant layer extends the hermetic seal range which is critical for applications that require leak-free and airtight packaging. Additionally, the coefficient of friction (COF) can be controlled using commercially available masterbatches leading to trouble-free vertical form fill seal (VFFS) operations even with sensitive films like metallized cPP film. Another product, Vistamaxx 6000, is engineered for high performance cast power pre-stretch (PPS) films. Using it as the functional layer of cast PPS films is said to offer strong stretch, superior holding force and tear propagation resistance at thin gauge. Vistamaxx 6000 is developed specifically on for wrapping application that offers over 250% stretch ratio in PPS films, said Mr McConville. Films with puncture and tear resistance and high holding forces are needed to keep pallets rigid and stable during transportation of goods. Achieving the same attributes with thinner gauge can reduce costs through reduced material usage. ExxonMobil Chemical’s Vistamaxx business is growing by 30-40% annually in Asia for the past five years, with an even better performance in China, revealed Ms Lo. 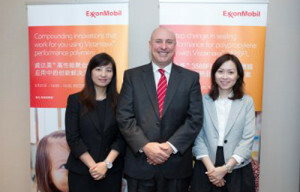 The “new normal” economy in China would serve ExxonMobil Chemicals well driven by the strong demand for higher performance in packaging lines, according to Mr McConville.